On August 17 I originally published this post and mentioned that I had only been able to verify that, by 1947, Harold Remine had attained at least the title of Assistant Chief Engineer of the Quebec Hydro Electrical Commission. I not been able to find information after that date about his career. My family believed he was Chief Engineer, but without an international subscription to Ancestry.com, I felt stymied at finding more information. That is, I felt stymied until I applied some watermarks to some Remine family documents and discovered a little treasure of information. 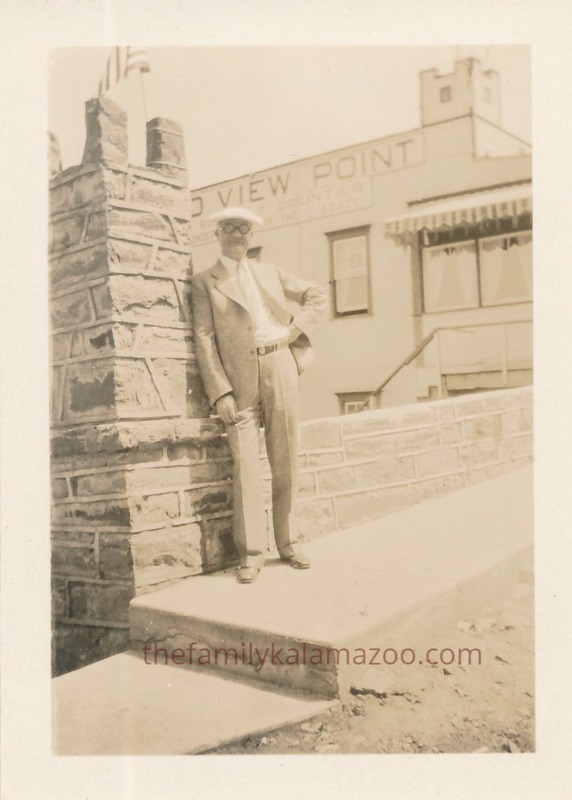 See below Harold’s photograph! Look at this little marvel of verification! Harold’s own business card. What does that say? CHIEF ENGINEER METROPOLITAN OPERATION DIVISION HYDRO-QUEBEC. Never give up hope because sometimes this stuff just falls into your lap! Now if I was willing to be extorted, I would expand my Ancestry account from U.S. to “international” and be able to do more Canadian searches. Alas, it has gotten so expensive! Anybody else irritated about that price? 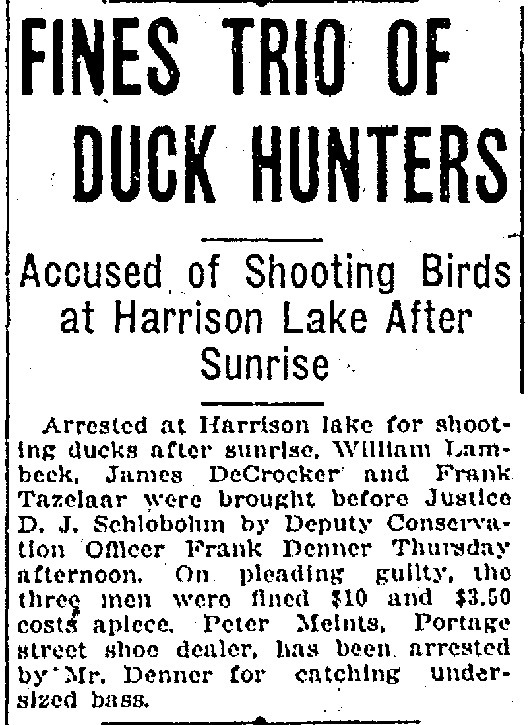 Harold Remine’s sister Therese lived a double life, you might say. For most of her life, and with homes in both cities, she switched off between Kalamazoo and Detroit. Therese worked as a teacher in Detroit. 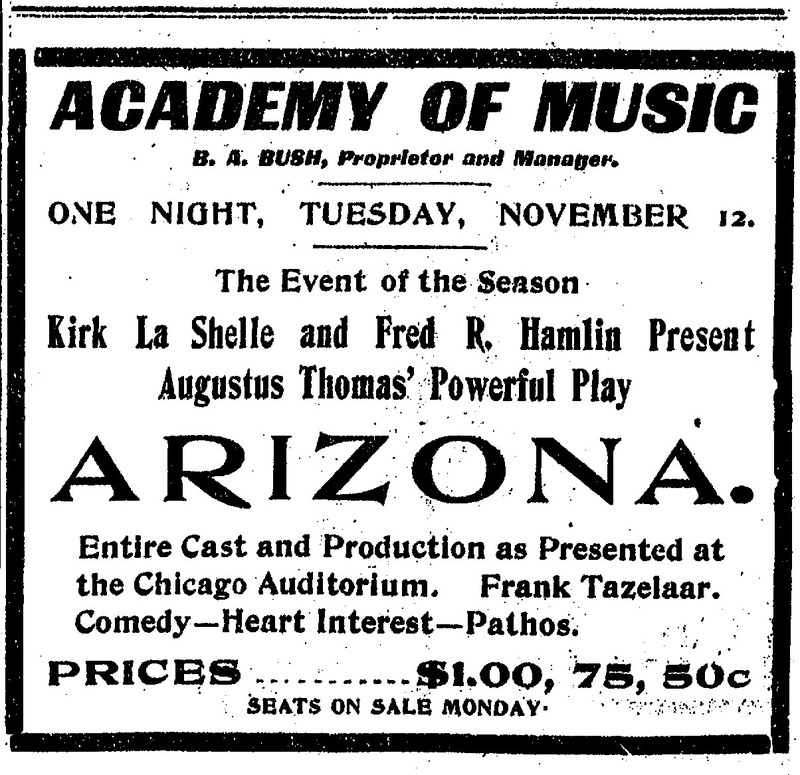 I found information in a 1930 city directory that Therese worked at Campbell School / Webster Hall (uncertain of this exact meaning, but there was a Campbell School and a Webster Hall). Then I was aided by my friend José who can found at his blog Enhanced News Archive. 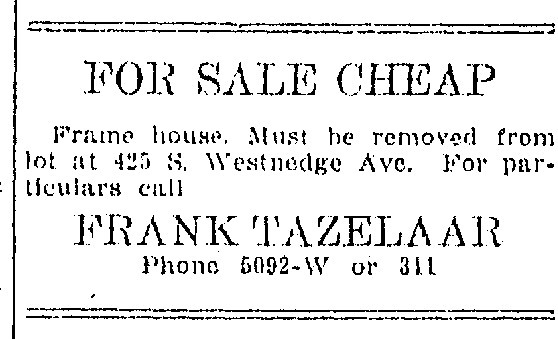 He discovered a 1957 city directory which gave important information about the house, but also mentioned that she worked as a teacher at Von Steuben School. I find it interesting that census reports give occupations and the industry the occupation is in, but not specifics of school names or company names. The house seems to be on Haverhill, although the cross street is not visible. Doesn’t it look here as if the front door faces Haverhill? I checked out the 1940 census, and both Haverhill and Evanston residents are on the page with Therese. Her house number is not given, so I can’t be sure which street she was on. Any ideas on this census for Therese’s address? These questions are answered below! 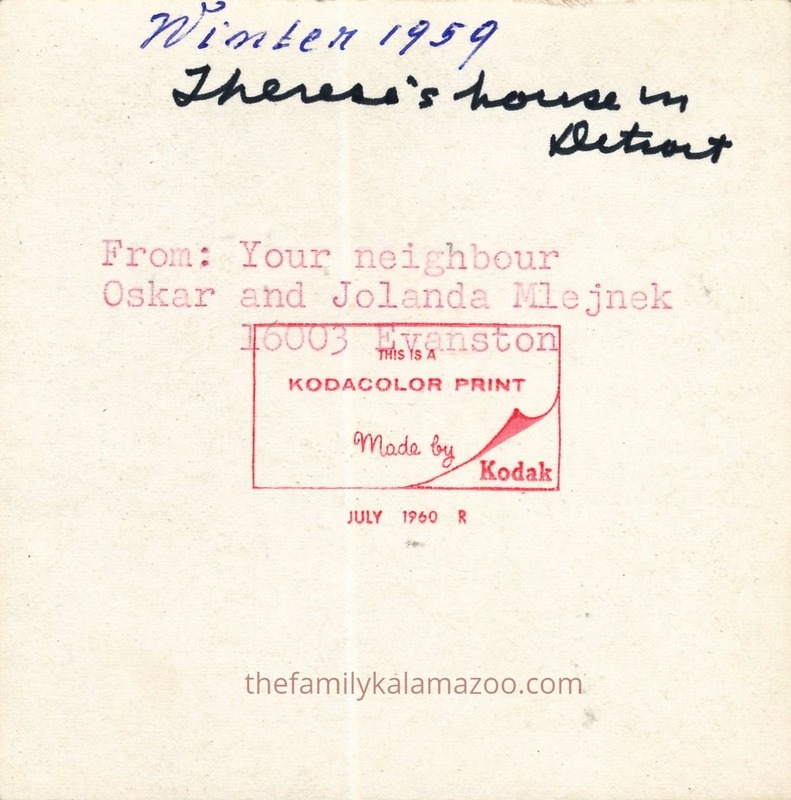 The back of the photo gives another clue to the location of Therese’s house. The neighbor who took the photo kindly left his (and her) name and address. Oskar and Jolanda Mlejnek, 16003 Evanston. I love that the date was given, too: Winter 1959. 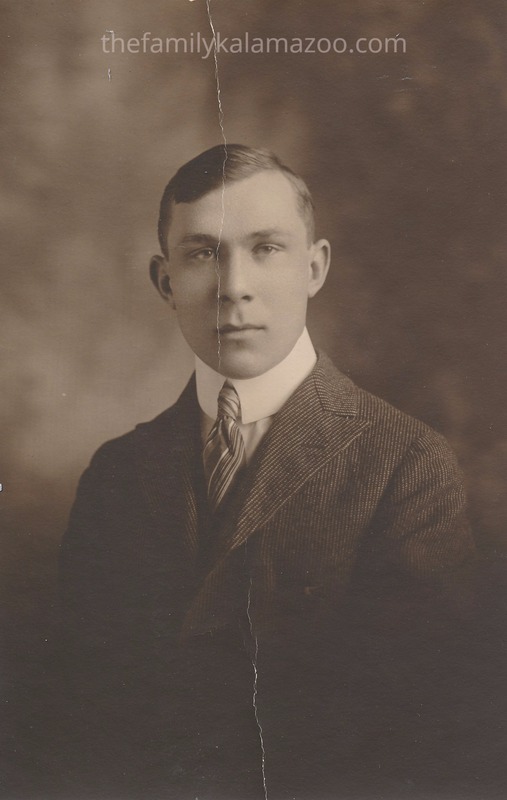 According to information I found about Oskar Mlejnek on Ancestry, he ended up moving to Grosse Pointe. These were beautiful houses on Evanston and Haverhill, straight out of 1930s and 40s movie “casting,” but the neighborhood changed over the years. According to what I see on Google maps many of the older houses are still there, but the vegetation is overgrown. It’s not even possible to see what 16003 Evanston looks like, although the upper level has been for sale, because the yard is so overgrown. Where was Therese’s beautiful home? I was able to pinpoint the location of Therese’s house, thanks to my outstanding blogger buddies: Karen MacArthur Grizzard, Amy, and José at Enhanced News Archive. 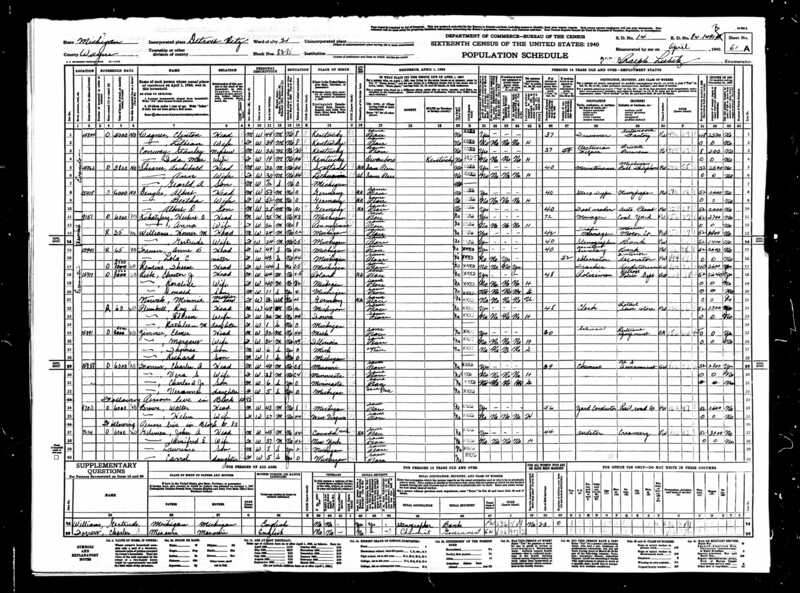 Karen first noticed that on the 1940 census, the two women listed above Therese appeared to be lodgers who rented from Therese who clearly owned the house. This gave me the address for the house: 15941 Evanston. Amy confirmed that she also read it the same way Karen did. And José did more research where he found the 1957 city directory which did, in fact, verify that the house was located at that address. From there, José located the correct address on the contemporary Google map. The house has been torn down, the yard is overgrown with vegetation, but as José point out to me, the other houses on the block are still there as he lined up the roof peaks from the old photo above with the new Google image. Thanks to these smart and experienced researchers, I now know the address of Therese’s house and that it no longer exists, although the other houses do. A hundred years ago it seems to have been commonplace to have postcards made from personal photos. 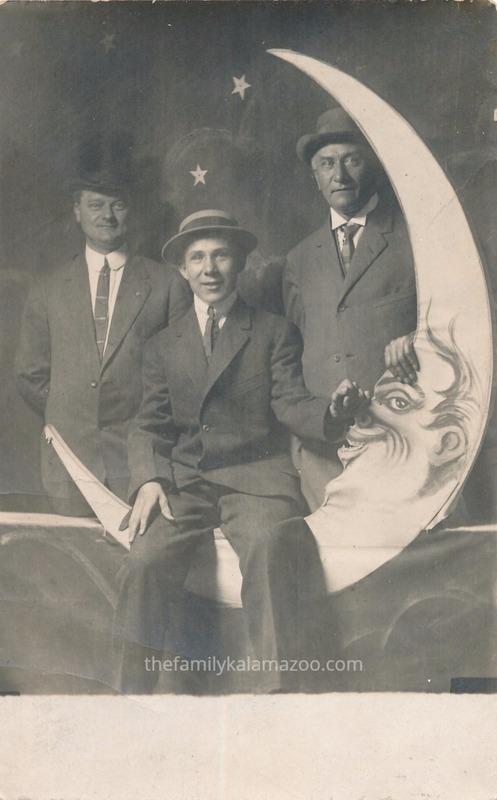 I found this example of an “occasional postcard,” meaning it was made on the occasion of Harold Remine sitting on the moon. 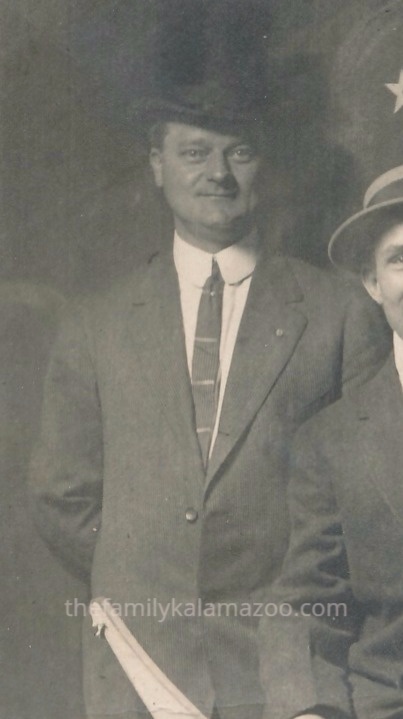 The two men with Harold are his brother-in-law Frank Tazelaar on the left and his father Richard Remine on the right (the taller man). 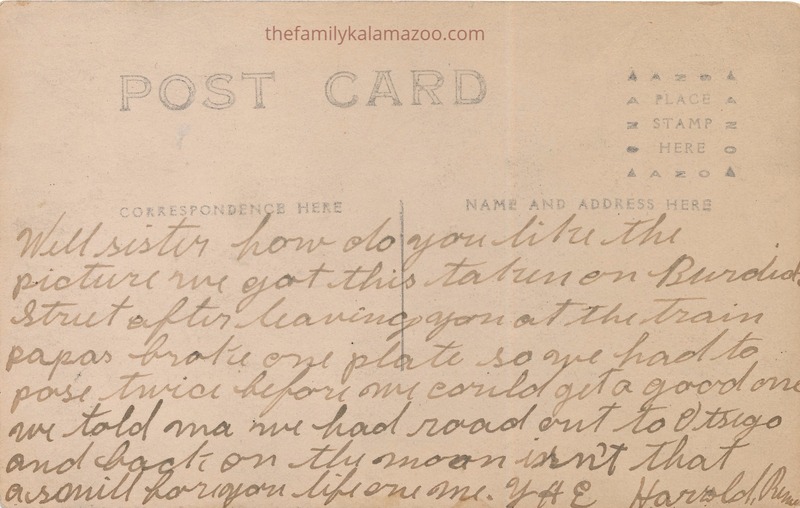 The postcard is addressed to Harold’s sister, Therese Remine or Genevieve Remine Tazelaar. He was the youngest of three children, the only boy, and Therese was the youngest girl–six years older than Harold. I think it might have been Therese. 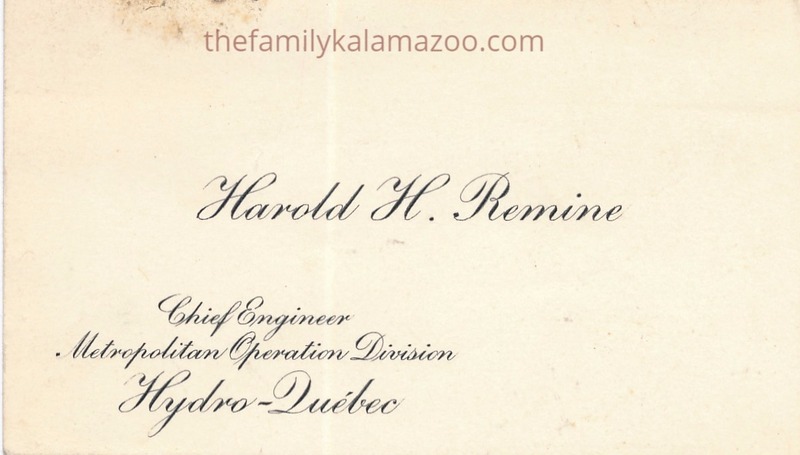 Apparently, at this young age, Harold didn’t believe in basic punctuation, such as periods and commas–or know how to spell “rode”–(and you thought only kids today are lazy), although he went on to graduate from the University of Michigan and become the Chief Engineer of the Quebec Hydro Electrical Commission. Can you read that last line? I can’t quite make it out. Also, what does YHE mean? I tried Googling it, but came up empty-handed. I assume the Y means Your or Yours. What do you think? When he refers to Papa breaking a plate, he means a glass plate or negative of the image. What Can the Photographer Tell Me (When He’s No Longer Here)? My last post Is it Live or is it Memento Mori? relied on information about the dates of the photographer of the photograph in question (whether the lady is dead or alive in the photo). 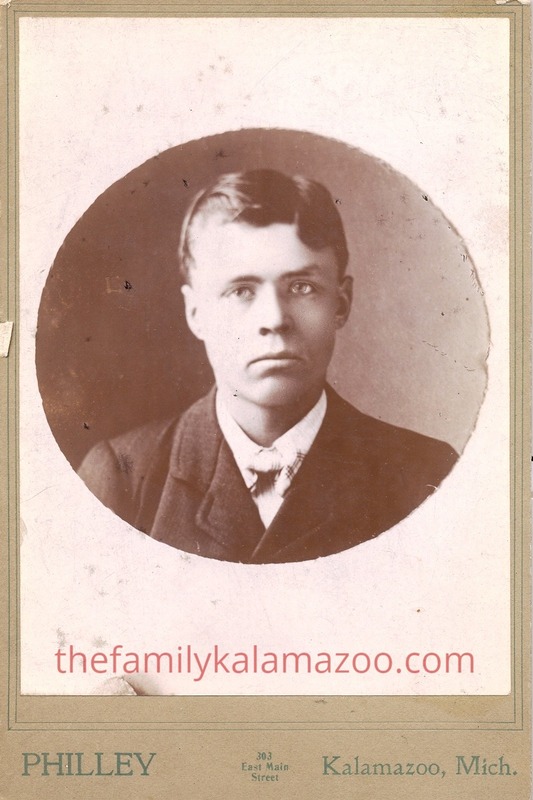 I used information from a listing of late 19th and early 20th century Kalamazoo photographers on Bushwacking Genealogy. I started wondering if I approached my photos from this perspective if I could add information to my identification of photos and dates. For example, this photograph of Carrie Paak Waruf was taken by Evans. Evans is not on Bushwacking’s list, but notice how the photo says “Successor to Packard 120 E. Main St.” So I looked when Packard seems to have stopped being a photographer at that address: 1887. But wait. Mary H. Packard seems to have been in business at that address in 1899. (The lesson here is to pay attention to the photographer’s address if it’s on the photo–they moved around quite a bit and it can help identify a year). 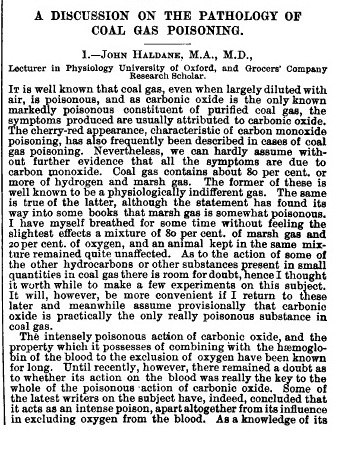 Her husband committed suicide in 1898. So who was Evans? And what year was this photo of Carrie taken? 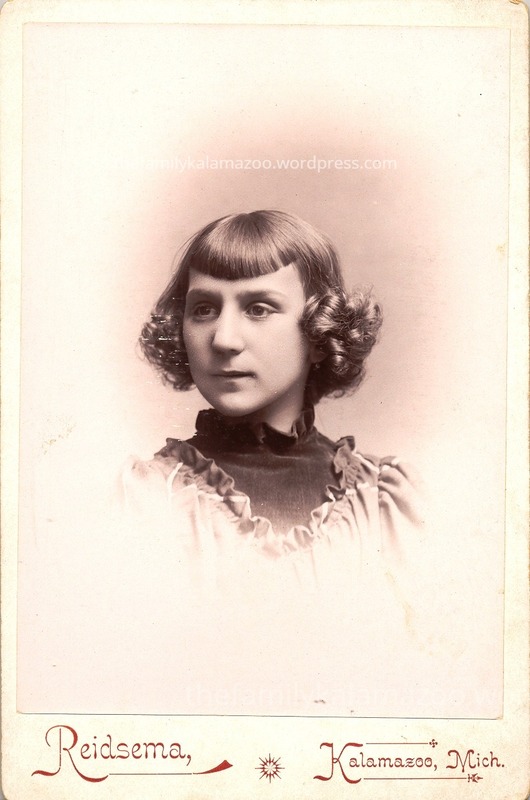 Carrie was born 8 May 1862 in Lexmond, Netherlands. She was my great-great-grandmother’s sister. That means that if Mary Packard was out of business by 1900, Carrie would have been 38 years old. And even older if it was sometime after that point. 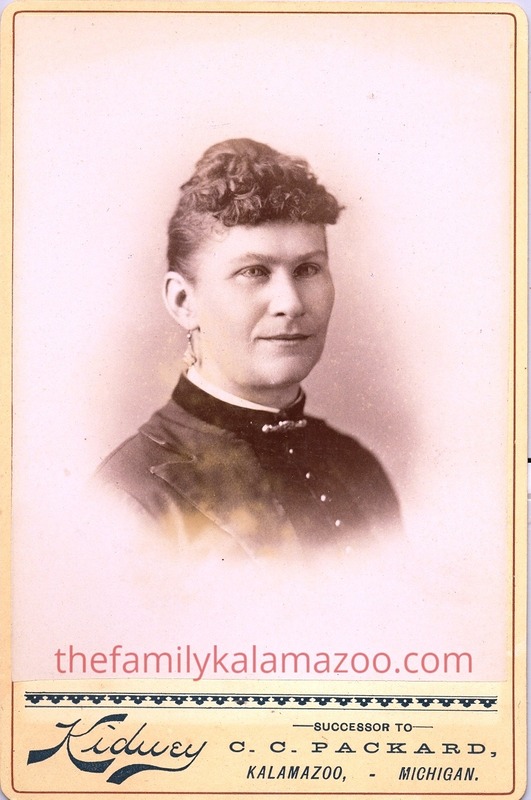 This woman is Jennie Remine Meyer (Meijer, married to Klaas Meijer who became Carlos Meyer). She’s my first cousin, 4x removed. How old do you think she looks in this photo? 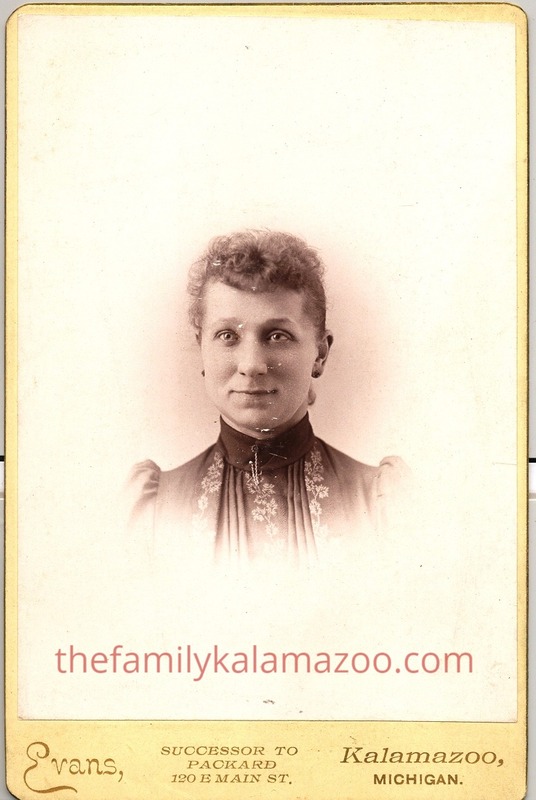 She was born 12 April 1860 in Kalamazoo. 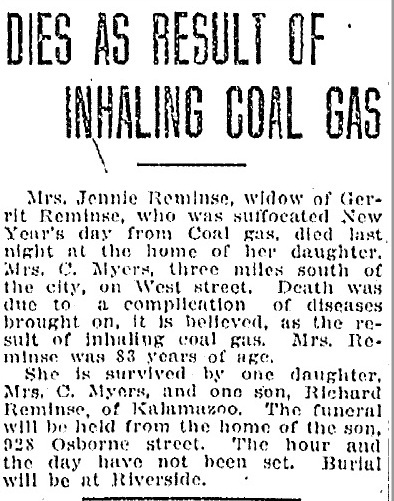 Just for the record, she passed away in Kalamazoo on 20 September 1940. This photographer also bills him or herself as a successor to C. C. Packard, the photographer who died in 1898. You are correct if you are guessing that Kidney is also not on Bushwacking’s list of photographers. This is where I wish I had a Kalamazoo city directory for every year right at my fingertips. If this photo was taken in 1900 or after she would have to be 40 or older. I think she looks pretty good for 40. No botox, no makeup, no hair dye. But she could be 40, whereas I don’t see how Carrie could be 38 or older. Then there are the clothes to consider. My instincts tell me Jennie’s clothing and hair is from an older period than Carrie’s, but that would be impossible because she is older than Carrie in the photos, but these two women are only two years apart in age. 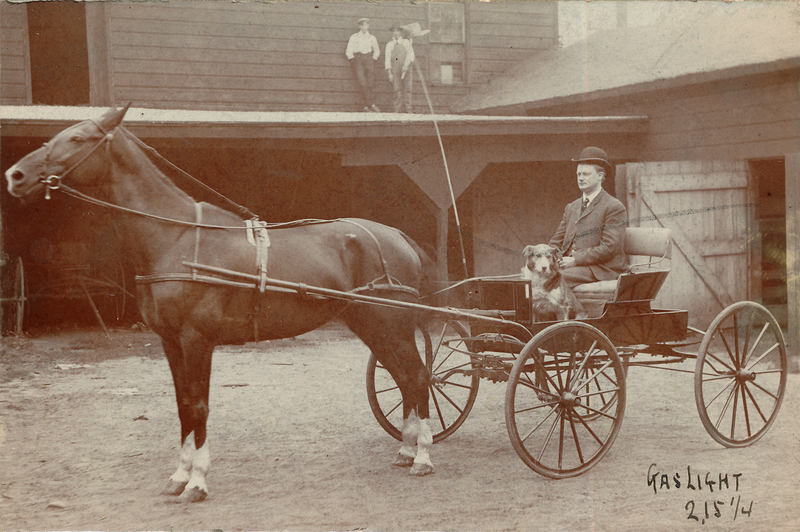 There is much work to be done on solving the mystery of these two “successors” to photographer Packard. Let’s just spot check a couple and see if the information on Bushwacking seems to correspond with the information I have about my photos. 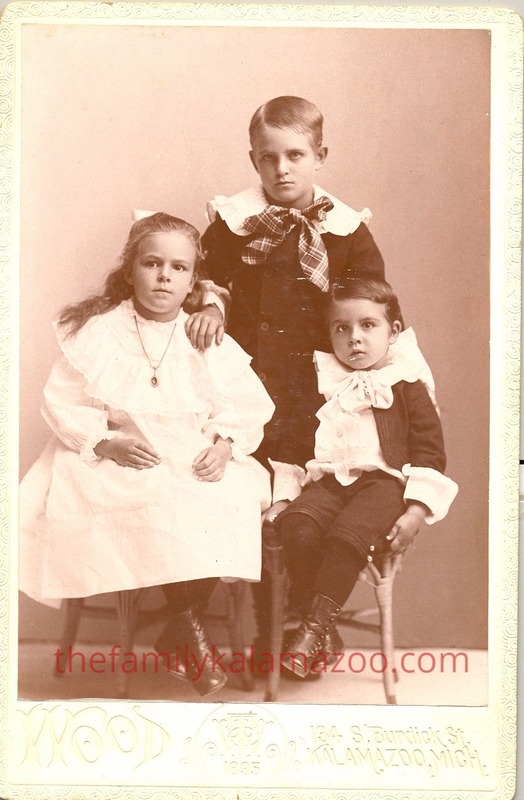 This is Gertrude, Richard, and Adrian DeSmit, the children of John DeSmit and Mary DeKorn DeSmit. 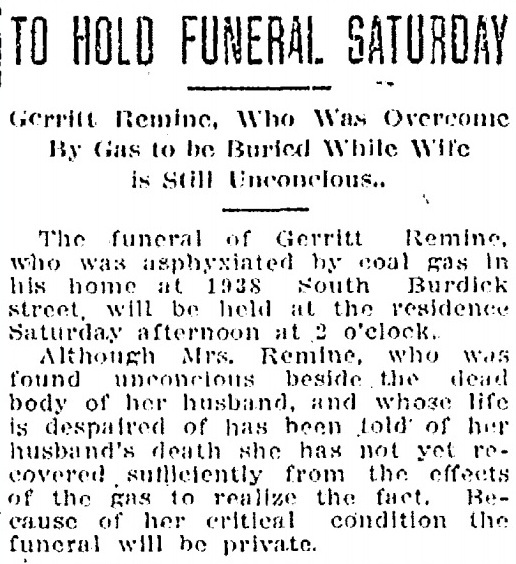 Gertrude was born in 1889, Richard 1887, and Adrian in 1891. If we assume that the children are about 6, 8, and 4 in this photo, the year it was taken would be 1895. The photographer Wood was Thomas E. Wood (also went by T.E. Wood) who was in business at least from 1887 to 1895, according to Bushwacking. She says he was not in the city directory in 1899. From 1887-88 he was at 316 E. Main St. From 1889-1895, he was at 134 S. Burdick St. 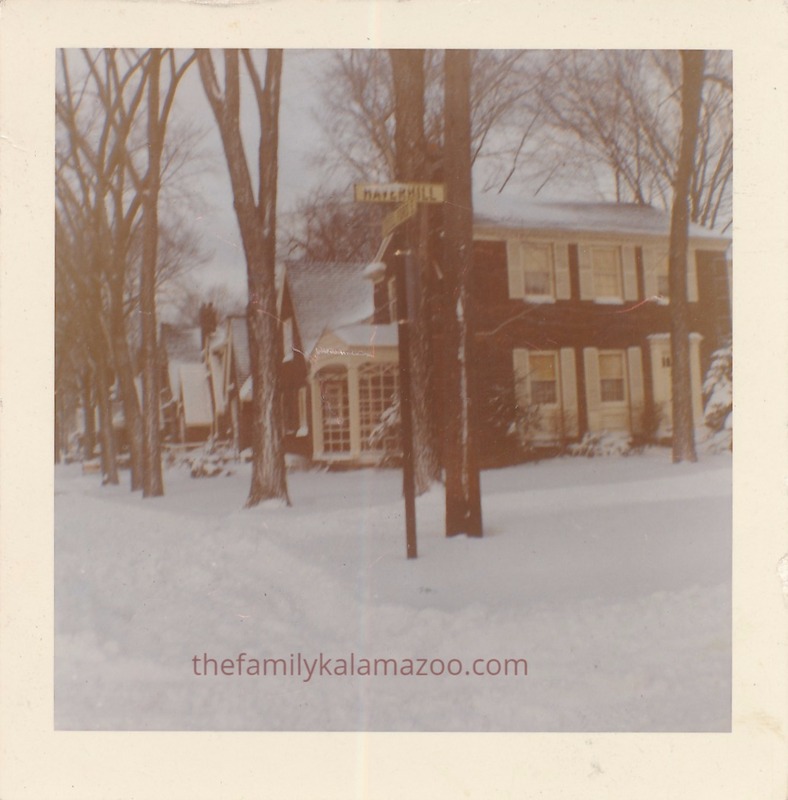 The address on this photo is 134 S. Burdick St. (way up the street from the neighborhood where my relatives lived). OH WAIT, what does that say in the middle of the bottom of the photo? 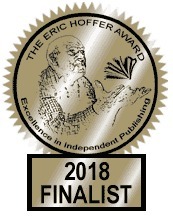 1895!!!!!!!! So my calculations about their ages was correct, plus it means that my grandfather was correct when he identified exactly which DeSmit children are pictured (there were many, but these were the youngest). This verifies my info about the photo, as well as the info provided by Bushwacking. Photographer Philley is not a common one in my albums, but he is on Bushwacking’s list. Silas Philley, Jr. 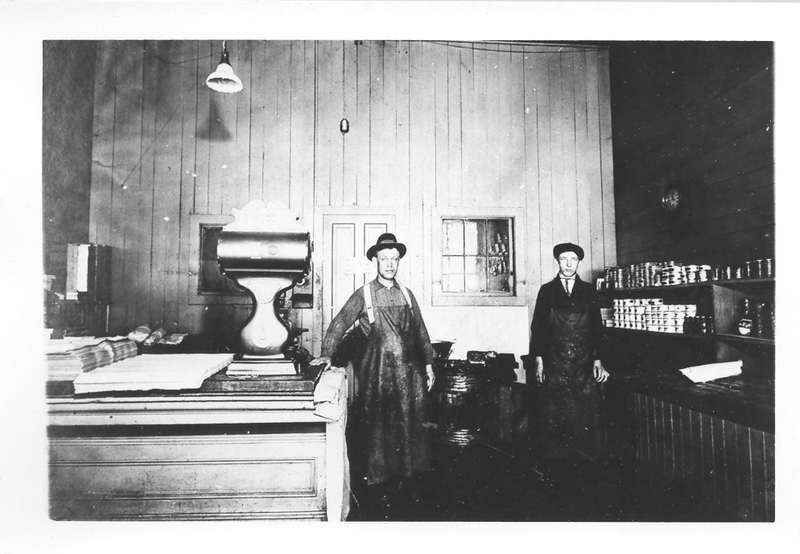 In 1895, he was in business at 303 E. Main, and in 1899 at 305 E. Main. This photo says 303 East Main Street. Gerrit died in the service of our military 23 July 1898. If you want to break your heart, read this: he only immigrated to the United States on in April 1897. I’ve written about him previously in several posts–his death, his life in an orphanage, and the court case he brought against a teacher. You can search his name in my blog’s search bar. But look at these dates. Since this photograph had to be taken in 1897 or 1898, it means that Philley was still operating out of 303 E. Main Street through that period. This helps narrow down the Bushwacking information a bit more. I wonder why this photograph was taken and who paid for it. Since Gerrit was a young immigrant, I wonder if his older brother Lou paid for the photo. And I also wonder if it was taken because he was leaving for Cuba for the Spanish-American War. Would the government have taken photographs of new enlistees? If this were true, there might be more photos of young soon-to-be soldiers taken by Philley at this time period.